Ecommerce is experiencing a new wave of innovation. While buying products online is now commonplace, the technology supporting e-commerce is evolving to eliminate any remaining friction in the purchase process. This article will examine some of the most exciting developments in e-commerce and how they are changing the retail experience. The first era of e-commerce took place using desktop computers. The next will take place in the palm of your hand. At the end of 2017 two-thirds of e-commerce transactions were completed on a mobile device. Retailers are responding by partnering with social media platforms such as Facebook and Instagram to drive sales. Consumers can now enjoy the entire retail experience on a smartphone and innovations such as fingerprint authentication remove even more friction from the purchase process. Another innovation that is removing friction from retail is the growth of voice search. Voice search using Alexa, Google Home, or other smart devices allows consumers to make a purchase verbally, sometimes without even seeing the product. Purchases through Amazon or Google can be authenticated using a credit card and shipping address on file. Voice search adds greater convenience for consumers and new challenges for retailers. As one business school professor noted, voice search using Amazon’s Alexa favors the company’s own brands at the expense of competitors. Brands depend on visual marketing to communicate with consumers and as voice search takes off will need to completely rethink their marketing efforts. It used to be that goods were shipped in a week and the customer was entirely satisfied. Amazon changed the game when it gave Prime members free expedited shipping. Now ecommerce sellers are racing to offer faster and faster delivery. Ecommerce sellers can simply go to Stamps.com to print shipping labels with the fastest delivery times USPS has available. Online shoppers have become accustomed to quick shipping and easy returns and retailers that refuse to play will lose sales competitors. Did you know that 48% of all Mexican imports come from the United States? And with an expected 84.9 million Internet users in Mexico by 2019, it couldn’t be a better time for e-commerce sellers to open their markets to online buyers south of the border. Here are the basics on shipping your products to Mexico vis USPS. Priority Mail Express International. For date-specific delivery and a money-back guarantee, you’ll also appreciate 3- to 5-day delivery on packages up to 70 pounds. Priority Mail International. With similar features to Priority Mail Express International (above), Priority Mail International delivers within 6 to 10 days. First Class Package International Service. If you’re shipping small, inexpensive items to Mexico, First Class Package International Service is the economical choice for packages up to 4 pounds, with 7- to 10-day delivery. Stamps.com International Flats Service. Stamps.com offers customers a special rate on shipping merchandise in Flats/Large Envelopes — up to 65% off international package rates. As with all international shipping, it’s vital to understand prohibitions and restrictions to Mexico. Lastly, here’s some sweet advice for U.S. shippers – as Mexico is the birthplace of chocolate, understandably the country takes that product seriously. If you sell chocolate or products made of chocolate, you must obtain prior authorization for these items from the Mexican Secretary of Commerce. It’s simple to ship to Mexico with Stamps.com! Here’s a rundown on the benefits you receive when you take advantage of Stamps.com’s services. Discounts on international shipping rates. Save up to 5%! Directly fill out Customs Forms. Save time – the Stamps.com interface automatically inserts your e-commerce order data into the Customs Form. Insurance savings. When you use Stamps.com, enjoy savings of up to 40% on international insurance. Our South of the Border neighbors represent a tremendous opportunity for e-commerce sellers. With several cost-effective shipping options to Mexico, plus extra benefits to Stamps.com users, you could soon be enjoying a fiesta of new business and simple solutions. Whether you need a good chef’s knife to carve up large cuts of beef, or a paring knife to core a tomato, knives come in handy for a variety of uses. 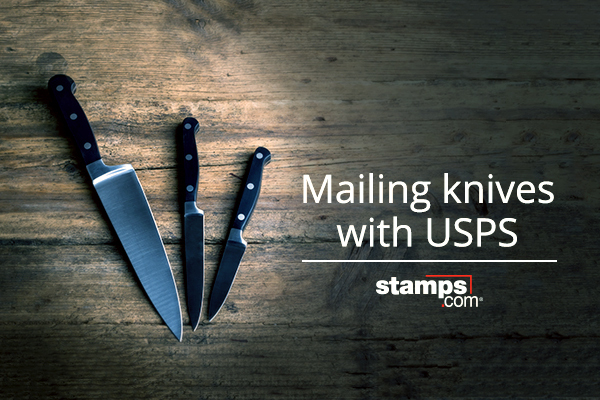 They represent an important consumer product, but can you mail knives and other sharp instruments through the USPS? The short answer is that it depends on the type of knife. Switchblade knives are severely restricted with the USPS. They are defined by the USPS as knives having “a blade that opens automatically by hand pressure applied to a button or other device in the handle, or by operation of inertia, gravity, or both.” Only supply and procurement officers are allowed to purchase and mail switchblade knives. If you’re a dealer or manufacturer of switchblade knives, you would still only be able to mail switchblade knives to procurement officers representing civic, county, state and federal governments. Mailpieces with switchblade knives should not be identified as such on the outside of the parcel. What if you’re sending a pocket knife to a manufacturer for repair? Or mailing a sushi knife to a friend? These knives are mailable. However, keep in mind that mailable knives must be cushioned and secured within the packaging. This would prevent any sharp edges from poking through the packaging. Make sure that there is no content shifting. Inner packaging is recommended, and if possible, sheathing the blade in question. Use plenty of cushioning material. This also goes for sharp-edged implements like ice picks, hatchets, stilettos and saws. The best rule to go by when mailing knives and sharp instruments is to avoid mailing hazardous items that could cause injury to postal workers: loose knives; badly packaged, sharp objects; and automatic, ballistic, and auto-open blades. When mailing internationally, keep in mind that some countries, such as Denmark, Uganda, Japan and the United Kingdom, explicitly prohibit certain types of knives. Learn more about USPS international listings. How do I format a military address? A three letter code associated with the type of location. APO is used for Army and Air Force installations. FPO is used for ships and Navy installations. DPO is associated with U.S. embassies overseas. The 5-digit zip code for the military unit. All military zip codes will start with a 0 or 9. What is my best option for shipping to a military base? Due to security restrictions, the USPS is the only carrier that can deliver mail and packages to APO/FPO/DPO locations. While carriers such as FedEx and UPS offer delivery to countries where military personnel may be stationed, packages from these private carriers cannot be delivered directly to a military base. Should I include a country in the military address? No! One of the most common mistakes when sending military mail is including a country in the address. Typically, including a country in the address will result in a delayed or rejected mailing. Is Military Mail considered international mail? No. In 1959 the Department of Defense and the Post Office Department agreed that the USPS would be required to provide continual mail service to military personnel and their families worldwide. Because of this agreement military addresses (APO/FPO/DPO) are not considered international addresses by the USPS, even though they may reside in foreign countries. How much does it cost to send a letter to APO/FPO/DPO addresses? When sending a letter to military addresses, you are only required to provide domestic postage. The current cost to send a domestic First Class Mail letter is $0.50 at the Post Office or $0.47 for Stamps.com customers. How is Military Mail processed? Letters and packages addressed to military personnel are first sent to Miami, New York City or San Francisco before being shipped to their international destinations. Once the letter or package arrives in its destination country, it is handed over to a Military Postal Service representative who transports it to the Military Post Office, from where it is distributed to the service member’s unit for delivery to the recipient. 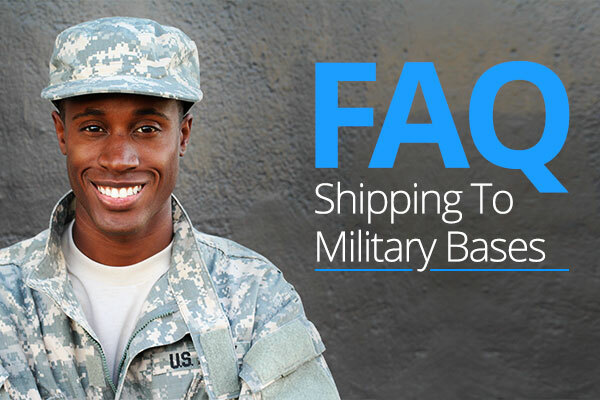 Do I need to fill out a customs form when shipping to a U.S. military base abroad? Since the recipient country may have restrictions on what can be imported, mailpieces addressed to a military destination must include a properly completed PS Form 2976 or PS Form 2976-A. What is the estimated delivery time for Military Mail? Can I ship electronics to military destinations? Many electronics are prohibited from being shipped to military destinations. A good rule of thumb is anything that sends a radio, satellite or phone signal is prohibited for being shipped to military bases. Prohibited items include mobile phones, cordless phones, GPS hardware and software, and FM transmitters. How should I package shipments to Military destinations? Be sure to package shipments securely enough to withstand up to six weeks of transit. Consider the destination of the package and extreme temperatures or conditions the packages may need to endure. If your package contains fragile contents add adequate cushion. If any portion of the box looks like it is sagging or can be easily depressed, add packing material on the inside.